I have to begin this post with a disclaimer: I know what comes next may sound crazy. Even so, it is my truth. Some months ago, my guardian angel was introduced to me in a dream. The image I saw was so vivid, it’s stayed with me ever since. I began toying with the idea of having her likeness made into a figure by a fine art doll-maker I came across on Etsy. Vilma is from Lithuania and her one-of-a-kind creations speak to me. 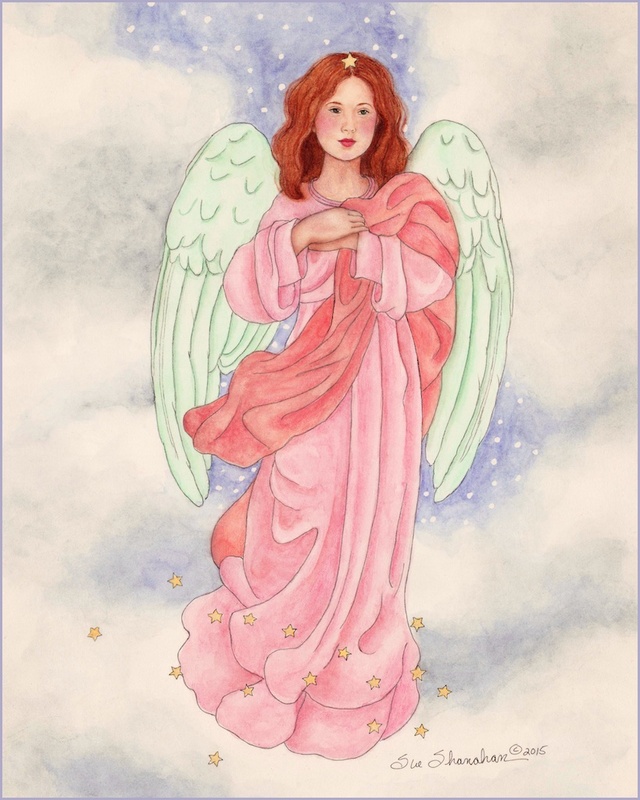 I contacted her with my request and a description of the angel. In her reply she asked me to send her a sketch. For me, that’s not as easy as it sounds. As an artist, my illustrations always stem from life, meaning I use photographic references. I may add magical elements to the piece, but they are always based on photos. I need to do that to get the realism that my muse demands. I was a little leery about drawing an image that lived only in my mind, but I decided to give it a shot. When my pencil rendering was finished, I posted it on my FaceBook fan page. I was surprised by how much interest it received. Quite a few of my followers said they were excited about seeing the finished art. Today is “ta-da” day, the day I’m sharing my angel with the world. I know the anatomy isn’t perfect but I’m satisfied that I’ve captured her essence. Many people are curious about what I learned from my angelic encounter. First off. my guardian’s name is Margaret but I call her Maggie (which is fine with her). She has green eyes and auburn hair (that may explain my mini obsession with drawing and painting redheads). As you can see, her robes are pink and coral, colors I would have never chosen on my own. Did you notice the star on the top of her head? She told me she wears it for special occasions such as Christmas, my birthday and the birthdays of those I love. I learned from Maggie that I share her with others in my life at times. By that, she meant if I’m concerned about someone she will do what she can to help. She also said that if I loved myself more it would make her job so much easier. That surprised me and has made me really work on how I treat myself. The most important thing she imparted to me is the more I invoke her help the freer she is to be a part of my life. Getting Maggie’s likeness down on paper has made her real to me. It’s a comfort to feel her presence. I try and remember to ask her for guidance because she sees the big picture. I’m sure some who read this will believe I was given a gift while others will think I’m delusional. Sure, it’s occurred to me that my dream sprung from an overactive imagination. Then again, I just may have taken a peek into eternity. Whatever the cause for my guardian angel’s materialization, I’m going to go with it. Believing we are all watched over and guided makes life so much easier. I love this story and it helps all of us to reach out for our own guardian angel. Imagine what the world can become with the help of those who can see more than we. Thank you for that. Knowing there are angels all around is such a comfort. What a blessing to you that you have seen what others cannot. How wonderful to have such knowledge of your guardian angel! Maggie sounds delightful and just the right kind of guardian angel that anyone would hope to have. Thanks for sharing your experience. Thanks, Amie. The post was a little scary to write. I was hoping not to sound crazy. I wish I would’ve had the dream when I was younger but then again, maybe I would have just dismissed it. I have always felt that I had a guardian angel looking over me and helping me through times of trouble. This was not in my older years but since I was a preteen! Please don’t ever think people will think you’re crazy, they just don’t understand! The angels that your heaven-sent talent has brought to life touched me like never before. Since I found your blog during Advent last year, my walk with angels still continues with books and sharings on angel encounters. But it is your paintings that helped to open up for me this Other World that not all eyes see. Your angel artwork have brought a kind of hushed, reverent beauty into my life. Even now, visiting your blog after some weeks away, just seeing Maggie, I feel a stilling in my heart. That’s no ordinary artist illustration, Sue. She is not a figment of your imagination. Maggie is real. You can see it in her eyes. There’s life in them. I shared with you before that I lost my son but later “learned” that he was an angel because there were identical marks on his shoulders before he left us. How I wish you could see him and if it was meant, to paint him for me. But I know life doesn’t always work out the way we want. You’ve been shown a glimpse of heaven by being allowed to see Maggie. I think more is to come. So, go forth in courage and peace and alertness. Just came over from Valeries blog. I have been self publishing for 10 years now, albeit not through Amazon. I simply would not do it any other way. Glad you discovered an outlet for your dream to come true, in book form! Oh, so true, Sue! I finally was able to watch the first section of the Angels Webinar and was really awed by what Lorna had to say. She contradicts my long held belief of having 5 guardian angels by saying we each have just one Guardian Angel forever, but there may be others who support us too, as long as OUR angel OK’s it! SO! 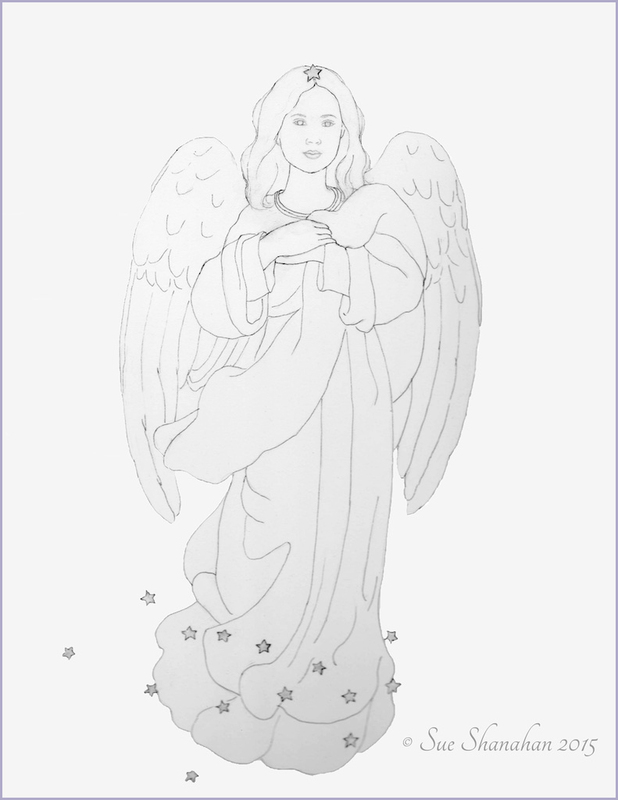 I think the 5 angels my dear granddaughter sent me consists of 5 healing/helping angels, since I have always had my guardian angel, though I never knew back in the day. I do believe my own angel chooses to let other angels help me because when I fall, I do it very suddenly and very quickly! Interestingly, my last ‘bad’ fall was on cement steps (the kind of old cement with rocks mixed in) and short of having a face that looked like the guys in the group Kiss I was fine. However I found myself afraid of our house stairs because there is cement at the bottom. I figured it was only time and in fact, I did fall, tripping over a tiny edge of a nailed down carpet. Just as I went down, I distinctly heard the words “get your head up and your hands out”! Those were the two skills I seem to have lost over time. I hit the cement with my hands out and my head up. Interestingly, I sustained a huge bruise on the outside of my wrist which wasn’t where I hit it. My husband’s comment was “I don’t know how in the heck you didn’t break your wrist”! Well, I DO! One time after that, I tripped again at the top of our stairs and just as I started to fall, I distinctly FELT a hand pushing very strongly on my chest and I stayed upright! Once again, I thanked my angel! I’ve only had one fall since then – while watering our flowers one summer evening this past year, I lost my balance, even though I was using my cane. As I went down, quite gently actually, I heard a huge CCCRRRRAAAAAK! Yup, I had broken my ankle – only the second bone I have ever broken and I was 70 then!! Not a bad record! A neighbor called an ambulance who transported me to the hospital – which happened to be right across the street from the Rehab facility my husband was in receiving intensive PT after very serious back surgery. Since I had no one at home to help me and I couldn’t put any weight on my ankle, I was admitted to the hospital for the requisite ‘3 midnights’ (doncha just LOVE government regulations!) and then Medicare would pay for my stay at THE SAME FACILITY MY HUSBAND WAS AT!! Coincidence? I think not! So we got to spend 4 weeks together with no worries and no stress before he went home a week before I did! Oh, and I only broke the fibia (the small bone that is attached to the tibia and connect by ligaments. Didn’t tear them either! Such is life!